Storm rocks hard – and not just because she used to wear a mohawk! Storm went toe-to-toe with Dr. Doom and won (Uncanny X-Men #145-147), even if she did get suckered into dinner with Doom first. Wearing only a bikini, she wrestled an alligator and knifed its a$$ good (Classic X-Men #22). If she weren’t married these days, we would totally ask her out. Of course, being taken over by aliens tends to put a strain on a relationship… But it’s nothing Storm can’t handle! 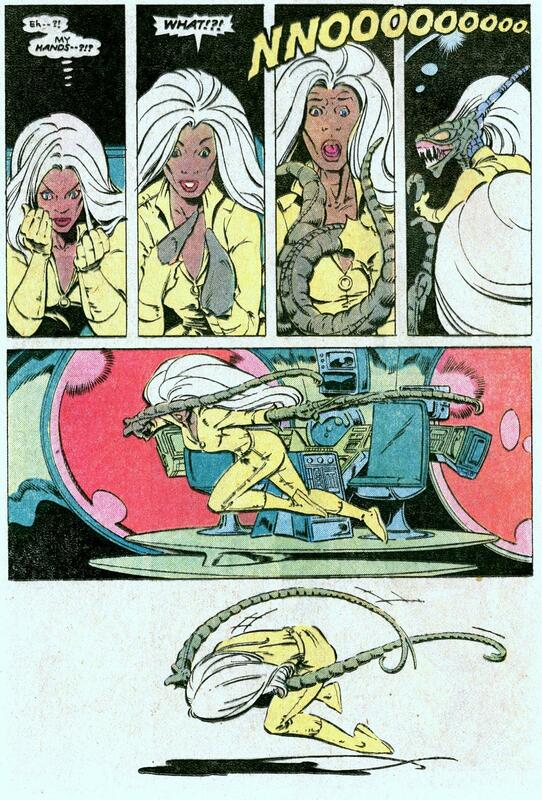 Behold how Ororo taps into the power of the galactic core to destroy the alien gestating in her body! – From Uncanny X-Men #165. – Also included, the Mike Mignola cover from the reprint in Classic X-Men #69.